The school that opened for the 2013-14 school year replaced the building next door that had served as Maynard's High School for 49 years. The high school before that one had served for 48 years. The next to last school had a troubled gestation. In 1961 the town vote was against building a new high school. This was short-sighted, as the existing school had an official maximum capacity of 350 students (already exceeded), no library and a too-small gym. One year later the vote went the other way, in favor of spending up to $1.7 million dollars to go forward. The project was way overdue. Projections based on the Baby Boom were that the high school population would swell to 600 in ten years. And in truth, it hit 644 in 1971. Junior high school students were already on split sessions due to overcrowding and the elementary schools were averaging 30 to 35 students per classroom. The new school relieved overcrowding across the entire school system. MAYNARD HIGH SCHOOL sign destroyed along with the building in 2013. The Class of 1965 was the first class to graduate from the school building that met its demise in 2013. Joseph Mullin was the class president of 124 graduating students. The class motto was "Non est vivere est valere vita," which translates as "Not merely to exist, but to amount to something in life." As for the newest iteration of Maynard High School - the sixth to serve that function since the town was incorporated in 1871 - construction broke ground in 2011. Classes began with the 2013-14 school year even though the building and landscape were still works in progress. Enrollment at Maynard High School ebbed from that 1970s peak of more than six hundred to numbers in the low three hundreds for the last ten years, resulting in graduating classes of about 70 students. There has been a recent uptick in enrollment, but still small compared to our neighbors. Acton-Boxborough graduates 450-500 each year. Nashoba (serving Stow, Bolton and Lancaster) graduates about half that number. To the south, Lincoln-Sudbury sees off about 400 each year, while eastward, Concord-Carlisle says good-by to approximately 325 seniors. What all ten towns share in common is that the great majority of their graduates go on to further education. One bit of history many current residents are unaware of is that Alumni Field became the school's sports site long before the high school moved to the south side of town. 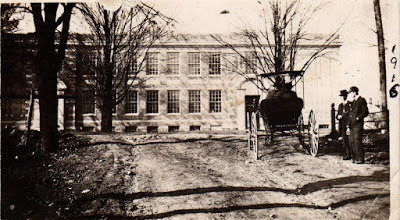 In 1928, while Maynard High School was still at the Summer Street location, the town transferred the land that had been the Town Poor Farm meadow to the School department. The football team started using the new playing field for the 1928 season. Within a handful of years Alumni Field gained a cinder track around the playing field, bleachers, hockey rink, field house and tennis courts. At the time of the incorporation of Maynard in 1871, the new town was served by ten teachers working in four small school buildings. Salaries were in the range of $9-15/week. 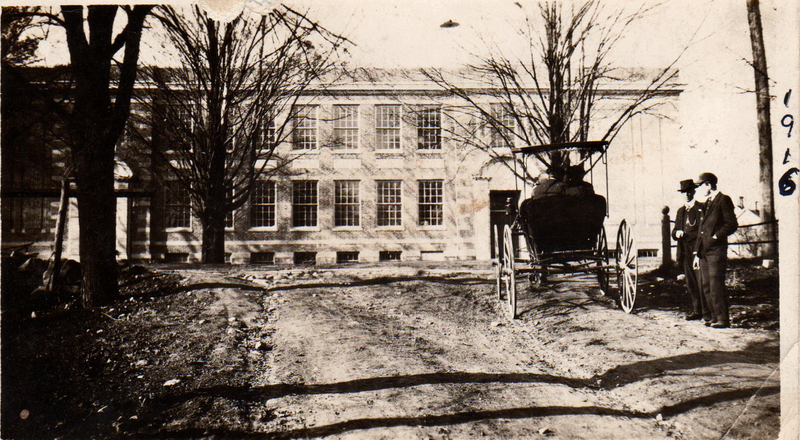 The small school building at Nason Street became the first high school, with a total enrollment of 35 students. Six years later a new high school was built on Acton Street (site currently occupied by Jarmo's Auto Repair). Then back to the Nason Street site, and then Summer Street before decamping to the south side of town. The third high school served from 1892-1916. This was a newly built wooden, 12-room schoolhouse at the current site of the Maynard Public Library. The school suffered a minor fire on September 12, 1916, then burned completely on September 20th. Both fires were thought to be arson. Maynard's new high school (1916). Click on photos to enlarge. The fourth high school started out as part of the building currently occupied by ArtSpace. Construction was completed in time for the start of the 1916-17 school year. The school was nameless until 1932, when "Maynard High School" was approved at a Town Meeting vote. A timeline compiled by Ralph Sheridan and David Griffin for the Maynard Historical Society noted, among these many facts, that football was reestablished as a school team for the fall of 1917, after a 12 year hiatus. The team lost the first game by 59-0. August marks the seventh anniversary of our son’s death. Most people don’t think of epilepsy as a potentially lethal disease. It is. Daniel’s epilepsy was part of his life from an early age. In spite of his epilepsy and his other disabilities, his attitude about life was “I want it all.” His goal was to live his life with as much independence and joy as possible. He was proud to work at a horse stable and a supermarket. He was happy to meet every person he ever met. Daniel lived in Maynard from 2000 to 2008. Then, at age 24 years, he moved to a supported-living house in a near by town, but continued to visit Maynard often. Walk around. Maynard is one of the few walk-around towns in the area. Where else do you have more than 40 restaurants, stores and shops within walking distance? Summer concerts in the park. A place to meet friends and listen to the town band work through a Disney medley. Erikson’s Ice Cream. Serving ice cream in Maynard since 1937. Friday night football. Whether you have kids at the high school or not, it’s not the worst way to spend an evening. Sometimes the opposing team has more cheerleaders than Maynard has team members. And still, often enough, Maynard wins. Volunteer to clean up the river. Because where else can you walk around in ankle deep mud dragging out tires with a bunch of friends? See a movie. Maynard has a movie theater. Acton does not. Stow does not. Sudbury does not. Concord does not. Drinking with friends. Daniel could not drive, but he did have a state photo ID so he could travel by air. And, as he figured out, if he ran into buddies from his high school days while walking around downtown, they could go to a local bar and he could use his “drinking license” to order a non-alcoholic (because of his meds) beer. recreation, housing and community involvement." Epilepsy affects one in a hundred people, and impacts the lives of their families and friends. It is our fondest hope that cures may be found - better drugs, better surgery - so that other families will not experience the loss that we sustained. In memory of Daniel, make a point of enjoying life in Maynard. This is the point in a column where readers might expect a request to donate to a specific health related charity. But the truth is we all have dealt with, or are dealing with, or will deal with disease and death in our own families. There is lots of advice on how to deal with grief, but it always boils down to: Get help. Take care of yourself. Take care of others. So, get help, take care of yourself, and support the charity that is right for you. Our family toast, before our evening meal, is "To family and friends, with us and gone." Maynard and Acton, two small towns in eastern MA are in the beginning stages of construction of a rail trail. In Maynard it runs through the center of town, with much consternation about how many trees are being removed. This column touches on tree clearing and urban trees in general. Two columns earlier is a lengthy description of the project, and in June, a history of same. A construction update has been posted in October. For those who remember the end of the Lord of the Rings trilogy (the books, not the movies), after Sauron was defeated, Frodo and his Hobbit companions return to the Shire, only to learn that Saruman and Wormtongue, aided by ruffians and abetted by hobbits who had turned to new ways, were cutting down trees to fuel steam-powered mills. From LOTR: "They cut down trees and let ‘em lie." Later on: "All along the Bywater Road every tree had been felled." After the deaths of uncounted numbers of orcs, humans, elves and one HUGE spider, we the readers were to get our undergarments in a bunch over trees. Trees! For Tolkien, this was a semi-autographical touch - he mourned the loss of the agrarian English countryside of his childhood. And now we turn to 2016, where in preparation for the rail trail construction through Maynard, 609 trees of diameter four inches and greater have been cut down, woodchipped and soon to be stump-yanked. Yes, I walked the dusty trail from one end to the other, counting tree stumps. A bit of back-of-envelope math puts the count at a bit more than 0.1 percent of all of Maynard's trees. Wait, wait, a September update! D'Allessandro decided that all of the trees bordering the trail parallel to Railroad Street were surplus, as were others south of Route 117 and north of Concord Street. Let's up the count to 660 trees removed. Stumps since cleared, so you cannot challenge my count. My town tree estimate derived from one on-line statement that New England forests have roughly 200 trees per acre five inches diameter or larger; 640 acres per square mile; town area of 5.4 square miles; subtract 40% of the total to account for developed area with fewer trees and water-covered area with no trees. Or subtract 50% to get a better estimate for our tree count and what was cut becomes 0.2 percent. None of this was a surprise. From the beginning the plan called for a twelve foot wide paved path through the wooded areas, flanked by two foot wide shoulders of either grass or packed stone dust, and in some locations a swale, which is a fancy term for a drainage ditch. The great majority of trees had grown up after the railroad stopped running, in the 1960s. Prior to that the railroad had used cutting and controlled fires to keep a wide swath of land to either side of the tracks vegetation free. Before we get too deep into this rationalization qua apologia that it was OK to cut all these trees for the trail, I readily admit that some trees are more equal than others. Two healthy London Plane trees at the corner of Nason and Main (both still with us!) are much more valuable aesthetically than a dozen maple trees across from Christmas Motors. The four trees that bordered Main Street near where the Farmers' Market sets up will be sorely missed (as will the hedge); likewise other trees that bordered streets, parking lots, the footbridge, and the back yards of many houses. As compensation, the rail trail project includes in its budget over two hundred thousand dollars for landscaping, including the planting of more than 500 trees. Homeowners wanting even more visual privacy may consider that this is the time to plant a hedge. trees into blue woodchipper. Click on photo to enlarge. Maynard has tree work to do separate from remediation of rail trail construction. Nason Street, part of Main Street and the south end of Walnut Street collectively have 36 sidewalk cutouts for trees. Current status is 23 healthy, five sickly, five dead and three empty spaces. Additionally, the grassy strip across from the Fine Arts Theatre recently lost two of four trees and one of the five maple trees planted back of Library has died. Replacement trees are needed. New sidewalk cutouts could be added farther east and west on Main Street. My point here is that summer shade is an essential part of a walkable downtown. If people are expected to walk between downtown and the mill complex, trees will make that walk more inviting. Worth a mention here that Mill & Main plans call for removing 40 existing trees and planting 88 new trees. Another ambiance-improving town project would be to purchase a strip of land between the now empty Gruber Bros building and the Assabet River in order to create a river overlook green space and pathway connecting Main Street to the rail trail. 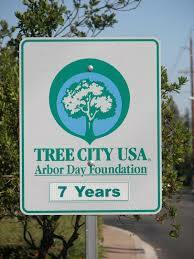 Maynard may also consider applying to be certified as a TREE CITY USA community, a designation established by the Arbor Day Foundation. This non-profit, non-government organization sets qualifying criteria as 1) maintaining a tree board or department, 2) having a community tree ordinance, 3) spending at least two dollars per capita annually on urban forestry and - wait for it - 4) celebrating Arbor Day. Neither Maynard nor Stow nor any of the surrounding towns are currently certified, but roughly one in four Massachusetts towns and cities are. Lexington has qualified for 27 years. Cambridge 24, Boston 20. Concord, not. The idea of being a TREE CITY USA is not just having trees, but rather having a government program that manages on streets and in parks.